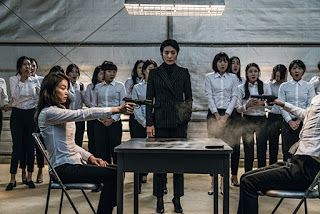 The opening scene of director Jung Byung-Gil's new film, which he also wrote with Jung Byung-Sik, is like from a video game perspective. All you see is an arm with a gun as it shoots it's way through halls of bad guys. Going through floors and room of armies of goons which are finished off effectively and thoroughly. We don't see the owner of that arm, until we see her in a mirror. Injured she manages to escape, only to be surrounded by the police. Although the shot looks seamless, it took several days of planning and precision With the current trend for more action women on the screen, this one is more of a revenge thriller, rather than a benevolent heroic wonder woman. Kim Ok-Vin plays Sook-hee from Yaiban, China, who as a child witnessed her father's murder while hiding under her bed. She is taken under the wing of Joong-sang (Shin Ha-Kyun) who trains her to be an efficient killing machine. She wants to find her father's killer to exact justice. Joong-sang eventually marries her, then she learns he's been murdered. Hence the rampage on the warehouse of bad guys, and her recruitment by a clandestine agency who gives her an option of working for them for 10 years before she can have a normal life. Sook-hee is pregnant, so her choices are limited. They give her a new face and after about three years of training, she is sent on her first mission. There's a motorcycle chase involving swords that is pretty cool. They finally set Sook-hee up on the outside with a new identity, a nice apartment, and a job as an actress. Unbeknownst to her hey also set their agent Hyung-soo (Song Joon) as her handler. And of course they fall in love. The agency lets them get married, complete with hired guest. Right before the ceremony, she is given a message to go to bathroom and snipe a target. But she fails when she see's the mans face. There are many elements of La Femme Nikita (the French Version), Kill Bill and other women orientated exploitation films in this. Kim Ok-Vin gives her character singular determination when fighting her foes, and a knowingly hopeless dream of a living a normal life with her daughter and husband. Amazingly she did not use a stunt double. Her chief Kwon-sook (Kim Seo-Hyung) doesn't want her to become as cold hearted as she is, but she is also singular in getting the job done no matter what. 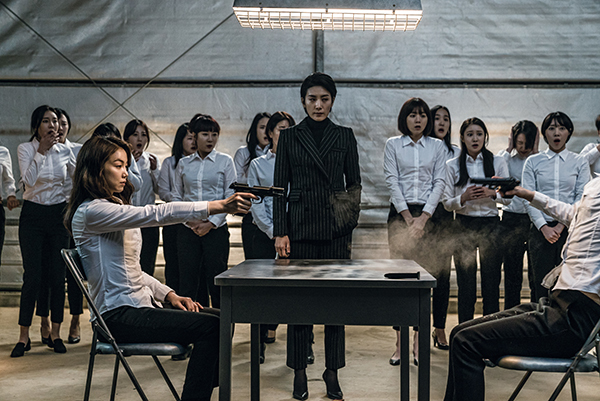 The plot with the Chinese - Korean gangs is a bit convoluted at times, and the frequent flashbacks are hard to discern from the present. It's a pretty violent piece with lots of blood splatters. But it's worth it to see some of the amazing battle scenes like the motorcycles, and jumping on a moving bus while hanging from a hatchet.